Nice workout, but I was shocked to see Hall's apparent reliance on sports supplements. Hopefully he was just going over the top to endorse his sponsors and doesn't actually eat that way. Unfortunately, Hall hasn't finished a marathon since the 2012 Olympic Trials. Speed Training for Runners at competitor.com serves up a reminder to distance runners who consider higher weekly mileage as the only road to better performance at 5K and above. Although I've seen some comparatively slow runners put up impressive times at long distances, improving top end sprint speed may be the missing piece for many, especially if you are beginning to notice an age related slowdown. The article offers up a few workout ideas including the value of a good warm-up, but no need to get fancy. Once every week or 2 seek out a soft surface and run some repeats from 50m to 200m with plenty of rest. If you don't mind the pain or embarrassment, run a timed mile before implementing speed training workouts to serve as a benchmark for measuring progress down the road. If you aren't able to improve your mile time, chances are sprint workouts aren't going to help you run faster at longer distances either. Bob Schul-5000 Meters- Never Forget Your American Olympic Champions! Americans Bob Schul and Bill Dellinger won Olympic gold and bronze in the 5,000 meters at Tokyo in 1964- imagine! Great Circuit Workout for Runners by Jay Johnson! Circuit Workouts for Running Times - Third Circuit from CoachJayJohnson on Vimeo. MY COMMENTS: I have to write these down- can't wait to try some in Youth Running Club! Great Hip Stretch for Distance Runners! Great for relief of IT band tightness, piriformis tightness/pain, and improved hip range of motion. This is one I am going to try! Should Your Recovery Runs be Faster? Perhaps I should reconsider my belief that recovery runs need to be slow in order to be ready for the hard workouts. You can't argue with his success. Is Barefoot Running Good or Bad ? Supporters of barefoot running make a variety of claims about its virtues -- but what does the scientific evidence actually say? Give Barefoot Running the Boot? Based on personal experience, I'm surprised by a couple of points: first, that shoe weight (up to 300 g, or 10.58 oz) did not have a negative impact on performance, and second, the researchers found no difference between shod and barefoot movements in their ability to strengthen certain muscles. Not surprising, researchers did not go out on a limb to support the use of shoes, rather made the point: "it is not known whether people running barefoot have more, equal, or fewer injuries than people running in conventional running shoes." Keep in mind this was not an actual study, rather a review of current studies already published. You can be sure there is more to come on this. My take is this- barefoot running is probably optimal if everybody ran on a soft grassy surface. The amount of protection required to run on roads is purely individual, and some of the minimalist shoes out there probably don't offer enough for the majority of runners, particularly those running high mileage. What's the Muscle AdaptationTimeline Following a Hard Workout? Answer: That's difficult to pinpoint exactly, but, says Pfitzinger, they're typically realized in about eight to 10 days. Joe Rubio, a two-time U.S. Olympic trials marathon qualifier and head coach of the ASICS Aggies, says that "most athletes will see a benefit from an individual workout 10-14 days after it is completed - How Long Does it Take to Benefit from a Hard Workout? According to this article, long intervals take the longest to recover from (8-10 days according to Pete Pfitzinger). It looks like they suggest short 200 meter repeats are the least taxing. The autobiography of Steve Ovett offers an inside look at 70s-80s middle distance running by an Olympic Champion (800 meters, 1980), and former world record holder (1500 meters and 1 mile). By today's standards, Ovett's racing schedule is something from another planet. In 1980, Ovett set world records in the one mile run (3:48.8) and the 1500 meters (3:31.36), not to mention winning an 800m Olympic gold medal (1:45.4) and bronze in the 1500m ( 3:39). From April 30- Sept. 6, Ovett competed in 25 races. He raced June 27 (1500 meters), July 1 (Bislett Games mile world record), July 3 (800 meters), and July 6 (3000 meters) prior to his July 15 world record 1500 meter run and first Olympic race on July 24. He set the 1 mile world record just 4 days following a 3:35 effort in the 1500 meter run, and the 1500 meter world best just 2 days after running a 3:52 mile. Is 30 Miles Per Week a "Health Threshold For Runners"
And Now a Word from Our Sponsors... Are America’s Nutrition Professionals in the Pocket of Big Food? A group of concerned registered dieticians have formed a more formal organization called Dietitians for Professional Integrity, aimed at pushing for more transparency and independence from industry Are America's Nutrition Professionals in the Pocket of Big Food? Although the existing evidence on whether long-term long-distance running causes osteoarthritis is currently insufficient for researchers to draw unequivocal conclusions, the preponderance of data seems to indicate that moderate levels of running do not increase the risk of osteoarthritis of the knees and hips for healthy people and that this activity might even have a protective effect." In this particular study, runners completed 3 treadmill runs to exhaustion in a warm environment: One trial was precluded by a 20 min warm-up, one wearing a cooling vest for 20 min, and one "without particular preparation." Runners ran for 32.5 minutes after pre cooling, 26.9 min after the 20 min warm-up, and 30.3 min after doing nothing. Effects of warm-up and precooling on endurance performance in the heat. In this small study that controlled for increase in body temperature, runners did better on a 4 min maximal treadmill run with lower levels of lactic acid produced and a higher blood pH maintained (blood pH decreases when lactic acid increases). Effects of active, passive or no warm-up on the physiological response to heavy exercise. MY COMMENT: Adjust your warm-up to the conditions, and do whatever you can do stay cool: stay inside if an air conditioned room is convenient, jump in a lake, or take a cold shower). Interesting study here that found you can increase hip range of motion with a targeted exercise routine, however that does not mean you automatically transfer to a greater stride length or improved efficiency as a runner. Improvements in hip flexibility do not transfer to mobility in functional movement patterns Authors suggest you may need additional focus on 'grooving' new motor patterns if new found movement range is to be utilized,in other exaggerated range of motion drills. Good summary by Dr Greg Wells. Aside from higher dopamine in BAN (banana trial), shifts in metabolites following BAN and CHO (6% carbohydrate drink) 75-km cycling time trials indicated a similar pattern of heightened production of glutathione and utilization of fuel substrates in several pathways. -Bananas as an energy source during exercise: a metabolomics approach. When the researchers analysed the bananas they found out what had caused the rise in dopamine level. 100 g banana contains 0.42 mg dopamine. The cyclists had consumed 6-7 bananas, so had ingested about 3.33 mg dopamine. The researchers exclude the possibility that the dopamine makes its way to the brain. It's possible that dopamine derived from food might enable the heart muscle to work harder. That didn't happen in this study; the rise in dopamine level wasn't high enough for that. But, write the researchers, banana peel contains higher quantities of dopamine than the fruit itself. "Future studies with banana peel-based supplements will reveal if high oral dopamine intake is advantageous for endurance athletes using similar performance and physiological outcomes", the researchers announce. MY COMMENT: Who knew bananas, and especially banana peals, contained dopamine? More dopamine, antioxidants, and interleukin? Sounds like grounds for further investigation, although you can bet the sports drink industry is scrambling to figure this out. I'd like to see more details such as what fluids were allowed during the banana trial, and what effects dopamine has on endurance. I still can't get over the banana peels-dopamine connection. I wish they had gone into further detail on the number of sessions per week, etc. Still, this is a good reminder not to overlook the importance of at least a weekly hill session, something I have not attempted in a long long time. Here is a post I did in 2011 on the importance of hills Powerful Hill Workouts by Owen Anderson. I admit that I've never given belly breathing anything more than a passing thought, thinking it's more of a "yoga type thing" with no real application to running. Perhaps I've been wrong all these years. Check out this video by Budd Coates Running On Air: Breathing Technique. If you are like me, always on the lookout for new ways to run faster, I think you'll take some time to experiment with belly beathing and the "in-2-3," "out-2," "in-2-3," "out-2" easy and the 3 count 2:1 hard running breathing rhythm. MY COMMENT: I like the progression here dropping to some lower seated positions. Give it a try! Michael Arnstein, a.k.a. "The Frutarian", provides a glimpse at his unusual lifestyle and fruit based diet. Check out his ultra race results here- pretty impressive. MY COMMENT: All I can say is that I find this facinating and my fruit intake has probably tripled since I started reviewing Arnsein's youtube videos. Ken Martin is a former 2:09 marathon and 2 time national champion. This is a must watch video! Check out this video on Flotrack if you are looking for new ideas for strength training exercises designed specifially for runners! 15 Healthiest Food For Runners from runnersworld.com. 1. KICKING TOE TOUCHES, SIDE LEG SWINGS, STANDING KNEE RAISES: Keflezighi begins his workouts with some dynamic standing exercises that hit the hip flexors, hip extensors, adductors and abductors. 2. BICYCLES AND SCISSORS: Lying on his back with his hips elevated (his hands supporting his lower back), Keflezighi completes a series of exercises including bicycles, scissors, and touching his feet to the ground behind his head. 3. SUPERMANS: Lying face down, lifts legs off the ground, alternating right leg/left arm raised and left leg/right arm raised; rolls side to side. 4. PUSH-UPS: Completes sets of full push-ups multiple times throughout workout. 5. PLANKS: Multiple positions: On elbows facing down, on elbows or straight arms facing up (reverse planks), alternates bent knees toward chest from reverse plank position, on side with and without leg lifts. 6. CRUNCHES: Multiple styles: Regular, crossover (oblique), Russian twist holding medicine ball (sits with feet on the floor, knees bent holding ball in front, leans back 45 degrees and twists side to side from the waist). 7. PIKE SIT-UPS: Extends arms above head while lying on floor, legs straight, facing up. Lifts legs and arms simultaneously, hands reaching to touch feet. Slowly lowers arms and legs to starting position. 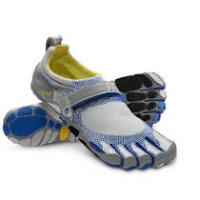 If you haven't yet, check out runblogger, who recently cited a study out of Ireland that found an 8% improvement in running economy after 4 weeks in Vibram Fivefingers . Great marathon advice from Rod Dixon, one of the most versitle runners of all time, who also won bronze in the 800 meters in Munich.